From his beginnings at the well-known Leon's on the West Side to his catering, Chef Bill Andrews is known for his distinctive dishes and his pleasant service. 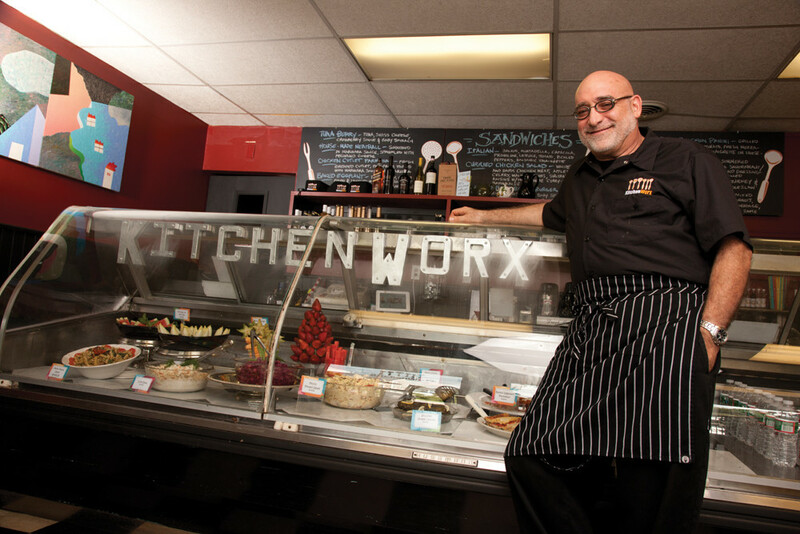 Tucked in on Waseca Avenue, off the main road in Barrington, Leon’s Kitchenworx is a place you have to seek out, and chef Bill Andrew has always been fine with that. “I like to have a destination place, [to] be a place you have to find,” he says. With a career in Rhode Island food service that stretches back decades, this is a man who has seen it all before, the highs and the lows. In some ways, Kitchenworx bookends his long career. Bill says the place feels a lot like his first venture after graduating from RISD many years ago: a cozy, unassuming place doing baked goods, breakfast, lunch and catering. Considering he grew up in a restaurant family, with his dad working as a short order cook and his mom in back making soups and entrees, it’s no wonder that he has returned to what he knows best. In between the cozy places of his youth and the present day is a long, and typically tumultuous ride with the restaurant industry. With Leon’s on the West Side, Bill was one of the first to establish Broadway on Federal Hill as a restaurant destination. Named for his late brother Leon, in the ‘80s he was at the spot now occupied by The Grange. Various renovations took him from four stools and catering to a full 66 seat bistro, and he hauled in the same kind of massive weekend brunch crowd we now take as a given on Broadway. After two decades of success, he switched to working in a more managerial role, as a research and development chef for Bess Eaton. In 2004 he opened a small bistro in Exeter only to be forced to close, as so many restaurants did in the great recession in 2007. He could not be kept away long though, and he began looking for a place this winter. This isn’t a man with frown lines. “I’m having a blast with this little place,” he says. He’s working hard getting the place on its feet in the first year, getting a team together and dialing things in, as he puts it, but he draws a lot of energy from the “bright young team” he works with. You get the sense that personal interactions, rather than just food, define his work. He plays host as well as chef, learning customer names, and is determined to create an intimate experience for regulars who can trust they’ll get quality. He also draws a lot of pride from the people he has worked and helped along over the years, many of whom have become very successful professionals in the catering and business end of the field, “a lot of them are doing better than me,” he says, with a broad smile. It’s this mentoring that Bill is looking forward to with his young staff. The food at Leon’s Kitchenworx is all made from scratch, including pickled peppers, his breakfast sausage patties, in-house roast beef and his baguette, white bread, buns and foccacia. Behind the deli glass my eyes were drawn to a thick Italian frittata, chock full of vegetables, nicely browned about the edges. Bill is excited about the brunch he’s so familiar with as well, serving a bit more thoughtful versions of staples like tomato-asparagus eggs benedict. He waxes lyrical about the cherrywood-smoked bacon he cuts nice and thick in back. He’d rather get an edge on quality he says, and then worry about how to sell it. Worry at times he may, but there’s no self-doubt here. “I can reinvent myself in a week,” Bill says, but comfortable in the familiarity of where he started, you can see why he doesn’t want to. 230 Waseca Avenue, Barrington. 401-247-1660. Making Cheesecakes with Chef Bill Andrews!